Innovative Extension Using Morris Leslie Modular Building System Completed in 7 Days. Construction of the new 1st floor extension at CPR’s Head Office in West Dunbartonshire has been completed after just 7 days. 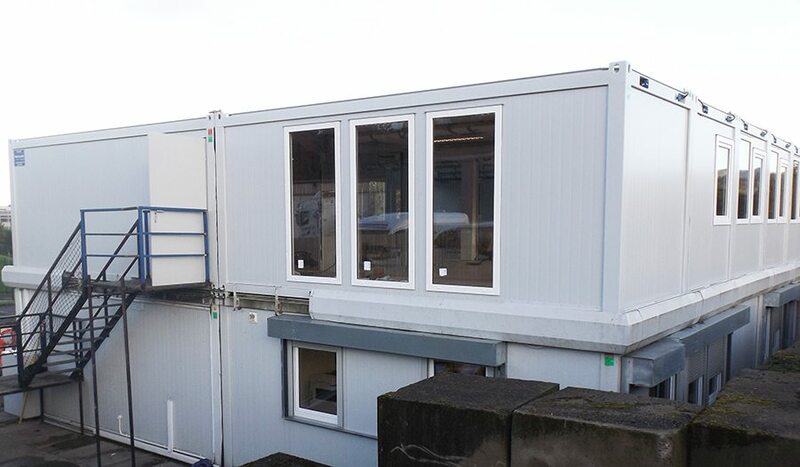 The office construction is built from an innovative system of modular buildings, supplied by Morris Leslie who has a partnership with one of the world’s leading manufacturers Containex, based in Vienna, Austria. CPR worked with Morris Leslie to design their space requirements. The modules are supplied with everything needed for the building’s fit out including external walls, windows with security shutters, insulation, flooring, toilet blocks, a kitchen (including the kitchen sink), open plan office spaces and a boardroom with spectacular double height windows, and fixtures and fittings. Their bespoke modular system arrived onsite on Monday 13th Nov 2018. Morris Leslie then constructed the building using a variety of insulation types depending on its location, plus all the fixtures and fittings required for heating, electrics, IT and plumbing. The next stage will be for CPR’s trade teams to complete the internal works. Morris Leslie will return to construct the internal stairwell between floors to finally complete the build.